I’m a volunteer at Hampton Court Palace and for the past year I have been working with the Dress Collection. 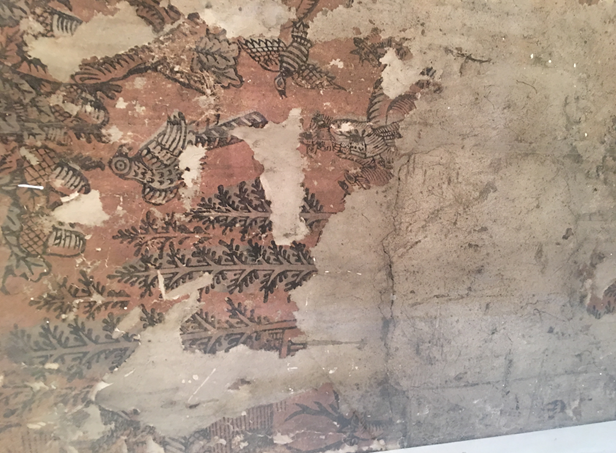 I’m interested in a fragment of wallpaper preserved in one of our store rooms and have been taking a closer look at the scene it depicts and what this could tell us (fig.1,2). I noticed that some parts of the scene which remained were repeated across the wall. To try and piece together the complete scene, I photographed all the best ‘bits’ preserved from each repeat, printed them out onto paper and on my dining room table stuck them together to form a collage. I then made a tracing, copying over the collage as accurately as possible (fig.3) to create the whole scene. The process of photographing and printing out the results onto A4 paper has led to some distortion in scale, but together the findings clearly show the details of an amazing hunting scene. Two men on horseback are riding with a pack of dogs through a wood; chasing a stag; they have come to a clearing with a small pond and houses. The first rider is wearing finer clothes and appears to be leading the hunt and jumping a fence. The second rider appears to be dressed in simpler clothing and holds his hand above his head as if releasing a bird into the air, which suggests he may be a Falconer. The riders are surrounded by birds, and trees with acorns and pinecones. The markings of some of the birds are similar to those of a bird of prey, perhaps a hawk or kestrel. A peacock can clearly be seen in the bottom right hand corner of the scene in front of a building. The buildings in the scene may have been hunting lodges and smoke can be seen coming out of the chimneys. These details, specifically the huntsman’s clothing, are significant, as they have allowed us to estimate a date for the wallpaper. The style and length of the huntsman’s coat and in particular the shape of the sleeves suggest the middle to later end of the 17th century. The date may be even earlier as an example of a similar image from the early part of the 17th century can be found in the Victoria and Albert Museum and shows a similar scene (fig.4). 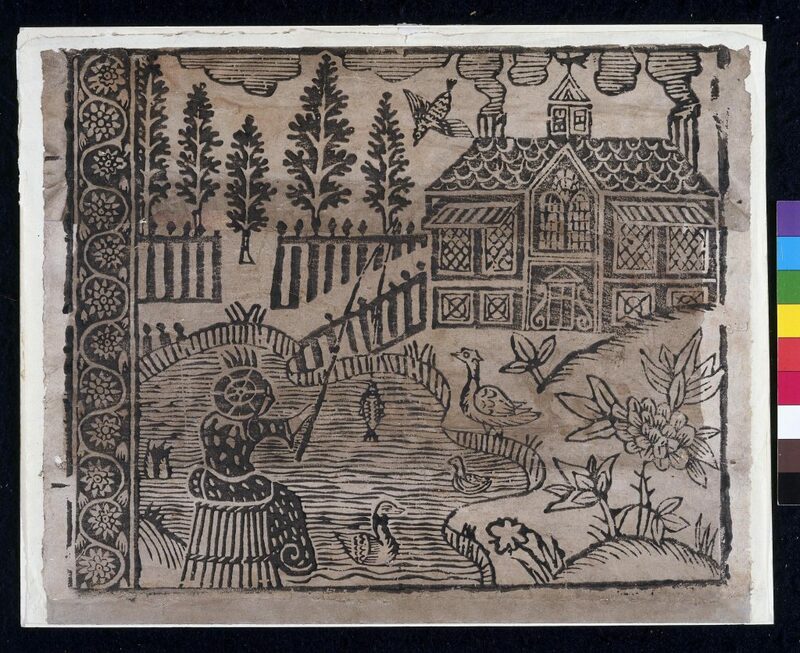 The similarities between the two scenes are striking – the trees, duck pond, house and smoking chimneys shown in the example at the V&A are almost identical to our wallpaper and show the same thick heavy line and quality associated with woodcut prints at this time. Further research suggests that this type of heavy line associated with woodcut prints was used to replicate an embroidery stitch known as ‘black- work’. This type of scene and effect can be seen on a number of 16th and early 17th century lining papers and wallpapers. 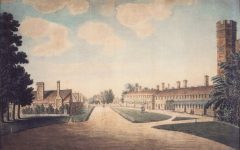 Similar lining papers have been found close to Hampton Court Palace, including an identical fragment in Esher, not far away. 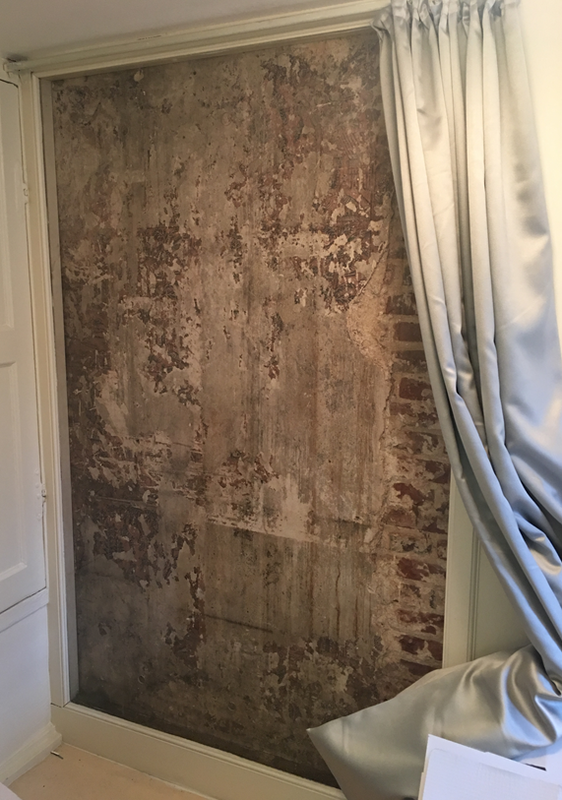 Interestingly the proximity of the find suggests that this part of Surrey may have once been the centre of production for this type of wallpaper. 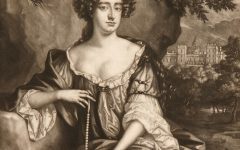 I am continuing my research and hope to try and establish who once occupied the rooms at Hampton Court Palace that were adorned with this amazing wallpaper. I loved reading about your findings. Thank you for sharing them! This is FASCINATING! Love the pictures (thank you for posting one of the full wall, as well!). Love how something that sparked an interest in you turned into learning so much about this! Again, great work! So interesting! I’m excited to know any new information you find. Lovely job Kate, very interesting find. 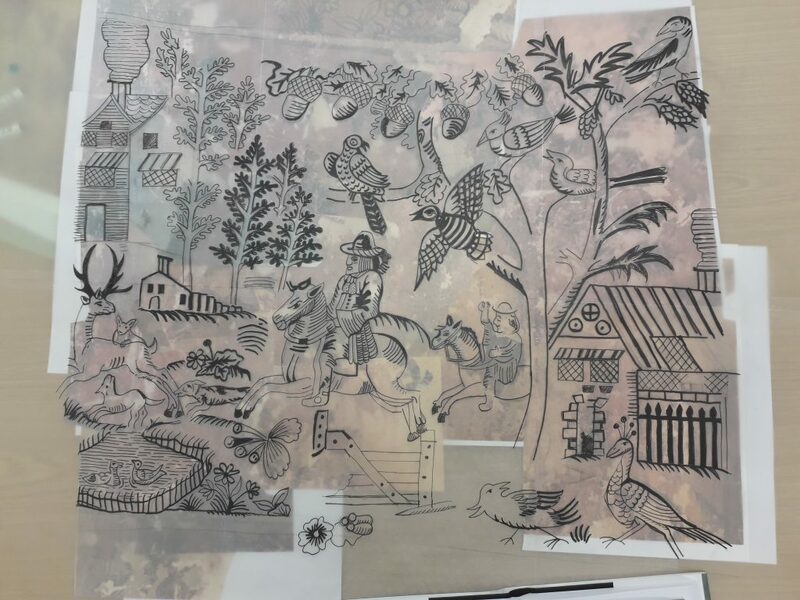 I work with old wallpapers and once conserved one of a similar date used as a lining in a coffer but it was covered in an emblem and strapwork with ‘oni soi qui mal i pense’ but it was woodcut block printed into small sheets joined together. These small sheets were reused and printed over so nothing wasted! It would be interesting to work out the sheet size. What an interesting article and I admire your dedication. I wonder who would have admired this paper when it was first hung? I’m looking forward to hearing more news. A great piece of detective work giving an amazing insight to the past, well done! 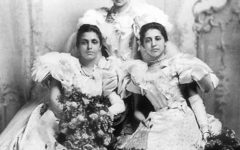 I love this blog post, what an amazing find and tremendous job on retracing it. This is utterly fascinating. I very much hope you find out more and I will check back. Kate, super detective work,practical skills and enthusiasm as one would expect from someone working in HRP. A brill piece, so interesting. Thank you for sharing it with us. Thank you for sharing your study ! A other example of this pattern was published by Anthony Wells-Cole p. 23 in the book Lesley Hoskins (ed. ), The Papered Wall, the history, patterns and techniques of wallpaper, London, Thames & Hudson, [1994 first, 2005.